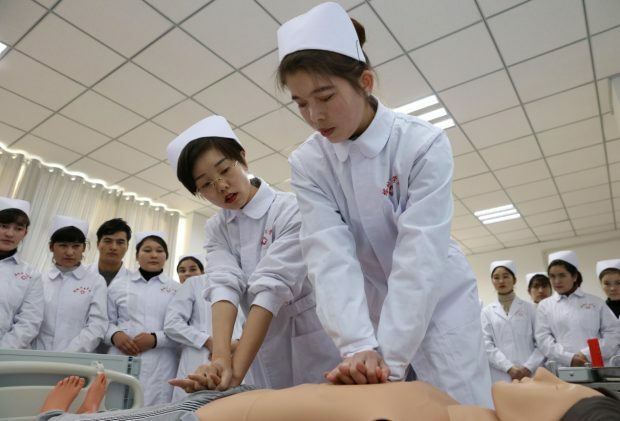 On December 13, 2018, Zhao Yanan (front left), a teacher from the Tacheng District Health School in Xinjiang Uygur Autonomous Region, taught students single-handed cardiopulmonary resuscitation. After China established vocational education and training centers in northwest China’s Xinjiang Uygur Autonomous Region, some western officials and media outlets constantly attacked China with groundless accusations. However, if they had paid attention to heated discussions about vocational education during China’s two sessions in early March and interpreted China’s moves from that perspective, their misunderstanding of China might be reduced. The Chinese government is determined to stabilize and expand employment. “Stepping up the development of modern vocational education is a strategic move that will ease current employment pressure,” reads the Government Work Report that Chinese Premier Li Keqiang delivered on March 5 to the second session of the 13th National People’s Congress. During China’s rapid growth and current economic transition, technicians and skilled workers are urgently needed. There are about 280 million migrant workers in China who are the main workforce for the country’s secondary and tertiary industries. Despite the huge number, highly skilled personnel are still in short supply as a majority of migrant workers don’t have a good academic or technical background that enables them to be competent. However, China’s industrial development is directly linked to workforce capability. In addition, people without wanted skills could face unemployment and be gradually marginalized. Marginalization will breed antisocial emotions that affect the stability of a country and its development. This could happen in China or in any other country. To prevent such destabilizing factors, vocational education and training centers have been established across China for migrant workers to improve themselves from big cities like Beijing and Shenzhen to smaller ones like Bincheng in East China’s Shandong Province. The Chinese government will allocate 100 billion yuan ($14.9 billion) to provide training for more than 15 million people to help them upgrade their skills or switch jobs or industries. The vocational education and training centers in Xinjiang are along the same lines. Underdeveloped education in the autonomous region has limited people from learning modern work skills. In addition, extremist thinking has forced some ethnic minority people away from the country’s development achievements and made them feel it is hard to integrate into modern society. Vocational education will help fix these problems, maintain the stability of employment and boost the development of China. The training centers in Xinjiang are part of China’s effort to prop up vocational education and enable more people to gain professional skills. Since reform and opening-up, the Chinese government has realized the importance of the workforce and attached great importance to improving its capability in both academic and technical aspects. Enhancing vocational education is in line with China’s lessons learned from development in the past decades. As China aims to comprehensively develop its economy, skilled workers will play a key role that affects the speed and quality of growth.